The Maumee River. Once pristine with numerous fish and wild life, today is known as the “Muddy Maumee”. Draining 24 counties in the tri-state area of Ohio, Michigan, and Indiana, the Maumee is the largest of the multiple watersheds that feed Lake Erie. This large area that is drained was once the Great Black Swamp. However, in 1859 a law was established that allowed public ditches which were dug and connected to drain the fertile swampland dry enough to till a for crop production. The crop production and development of the area lad to the degradation of the river. Now the Maumee is said to be the cause of 50% of the sediment and 40 % of the phosphorous that is depositing in Lake Erie. Even though agriculture gets most of the grief for polluting the river, run off from road ways and yards goes to the same place and contributes to the problem as well. These are problems that we all need to work together to solve. One thing to remember is that however muddy the Maumee may be, there is still beauty on this scenic water way. There are shallow lime stone beds are perfect for walleye spawning, and miles of river to go canoeing or hiking along. This important beauty is worth all of us to protect. Emerald ash borer – Does it matter anymore? Since it’s arrival in 2002, Emerald Ash Borer (EAB) has appeared in many news headlines. The ash tree once graced many lawns and sidewalks with its shade. Now, most all of the ash in the midwest have succumbed to EAB and have been removed for several years now. So why, since EAB has successfully invaded our forests and lawns, is this insect something we should still be aware of? EAB enetered North American through shipping pallets near Detroit, Michigan. It is very unlikely that EAB would have entered North American had it not been transported from its native region, Asia. Each day, many products enter our ports and for many of the imports, there is little tracking regarding the “stowaway” organisms that may be present. For many of these pests, there are very few to no competitor species present. This contributes to the organism’s ability to quickly invade an area and become established. In short, yes, EAB Still matters. It matters in how we deal with our international commerce and trade, it matters how we approach the next disease threatening our forests and ecosystems, and it matters economically. While there is some hope for a potential return of a resistant ash hybrid, it still may be decades before ash trees are grown again. And it is clear to everyone that it would have been a lot better if EAB had not been introduced in the first place. So, for the sake of our forests and environment, please be aware of what you may do that could contribute to the spread of any invasive species. Emerald ash borer should serve as a warning – if we are not careful, another ecological disaster could materialize. Elizabeth Callow is a fourth year student studying Sustainable Plant Systems/Agronomy. Guitars have been built of many different materials throughout their existence; acrylic, metal, Lucite, even cardboard. However, there is one material that gave birth to the instrument centuries ago and continues to keep guitarists mesmerized today: wood. Specific tonewoods have dominated the guitar building arena including spruce (primarily acoustic guitars), mahogany, alder, ash, maple, ebony, as well as the prized rosewoods. Woods have their own characteristics as providers of “tone.” Some are deep and full, others bright and crisp. 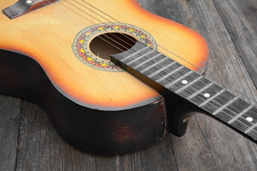 One interesting aspect, especially when considering acoustic guitars, is the aging process of a tonewood, including the playing time applied to the instrument. Many guitarists will swear to you that their 40-year-old spruce top Martin guitar sounds better and “richer” than the day they bought it. And there may be some science to their claim. Researchers at the University of New South Wales published results of the effect of aging and playing on violins. Unfortunately, the study only lasted 3 years, and in terms of vintage instruments, this would still be the infancy of the life cycle. So, it may remain a subjective question that only time will tell. One certainty is that humans respond to music and the creative circle it fuels. – Christian Young is a Plant Health Management major. When not studying chemistry and learning about plant health, he can be found with his guitar in front of his 100-watt amplifier. From a young age we are told that pop, smoking, and playing with fire are all bad things for our bodies. As a child our naïve minds took in everything our parents said because they were always right; or so we thought. Not everything our parents tells us will be 100% true, just like not everything scientists tell us about food nutrition is 100% factual. This past week I uncovered some unsettling news about who our research comes from. At first glance, it comes from the scientists and professors at universities. However, if you dig a little deeper, it’s actually from large food corporations that are paying the middle man. This collaboration paints a very different story when evaluating the claims that the researches state. Perhaps one some of the most compelling research done on this debate topic is found on Dr. Marion Nestle’s blog. Dr. Nestle is a professor at the Department of Nutrition, Food Studies, and Public Health at New York University and over the past year, she has uncovered some of these biases studies. After looking at a total of 168 funded studies, she found 156 of them to be favorable to the sponsor’s interest. And this is just the surface. Dr. Nestle did claim on her website that she has yet to thoroughly analyze the content of the studies and will be stopping the study. However, she strongly sees a possible correlation between the sponsor and scientist hired.